Pamper your skin in a luxurious treatment! 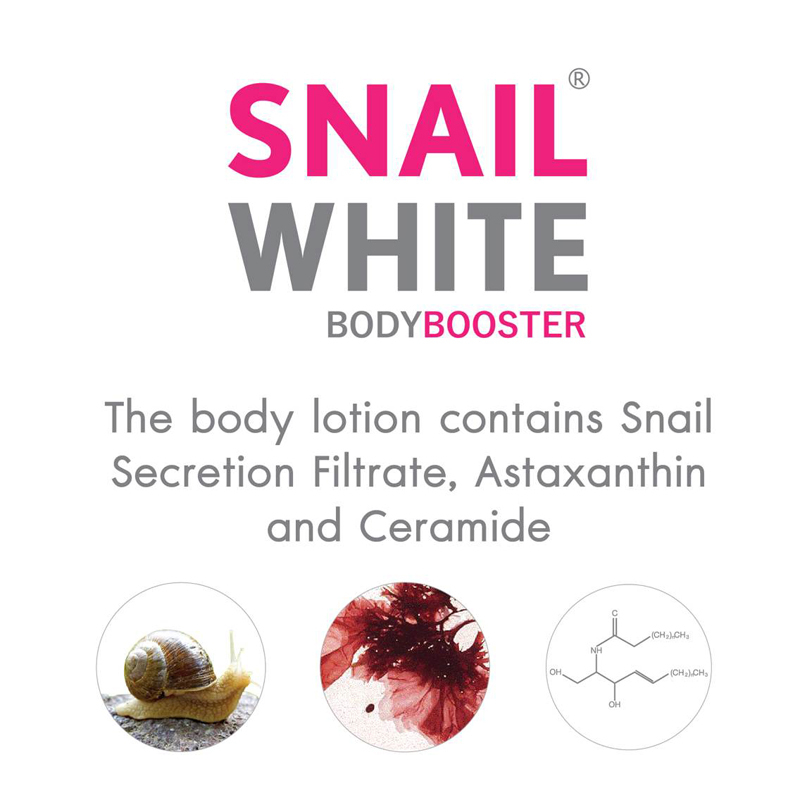 A deeply luxurious and quality body treatment using the ultimate combination of high quality concentrated ingredients under SNAILWHITE which rejuvenates, rehydrates and regenerates the skin. Indulge and pamper your skin the nutrients it needs and with the use of this intensive body booster, it addresses body issues like aging, fine lines, wrinkles, dryness, acne and breakouts, hyperpigmentation and dark spots, enlarged pores, and dullness. Let’s welcome a luminous, supple and firmer skin which gives off a velvety touch, to an even and fairer complexion! Best recommended to use twice daily and don’t neglect your skin now! P/S: Average usage of a bottle is around 3 to 4 months depending on individuals. Individuals’ result may vary. This intensive and hydrating body treatment is generally suitable for all skin-types, females and males. Enjoy and pamper your skin in a luxurious treatment in the comfort of your own! Taking care of our body from head to toe is deem necessary as well and not just our facial complexion! Several case studies have also shown that majority of the population have neglected taking care of their body skin and focused more on their facial complexion. What could all these result to? Some of us might be facing one of the common skin issues, uneven skin tone, which is the result of neglecting our skin too often! In this case, it is our body skin! How irksome it is to look into the mirror with two different skin tones? 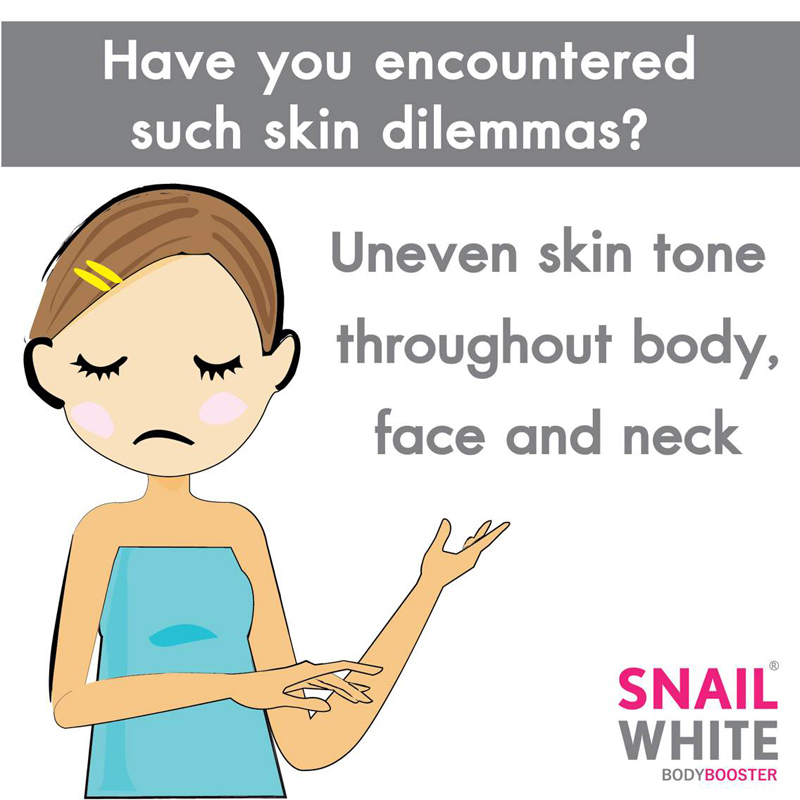 If you presume this as no big issues, let us bring you through why you should start taking care of your body skin as much as your facial complexion now! Skin issues will not start bombarding you immediately but will build up over a period of time and when you fully realized, it will be too late! 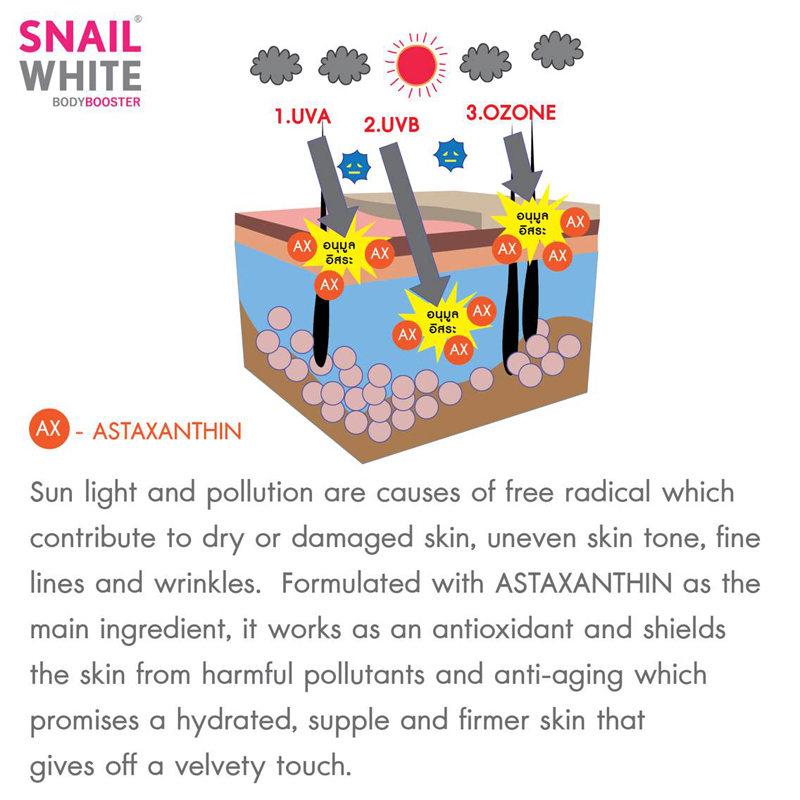 Your skin will be too weak to fight against the harmful pollutants, resulting in aging of skin, wrinkles, fine lines, drying of skin due to high intensity of sun exposure and not forgetting the worst nightmare, skin cancer! 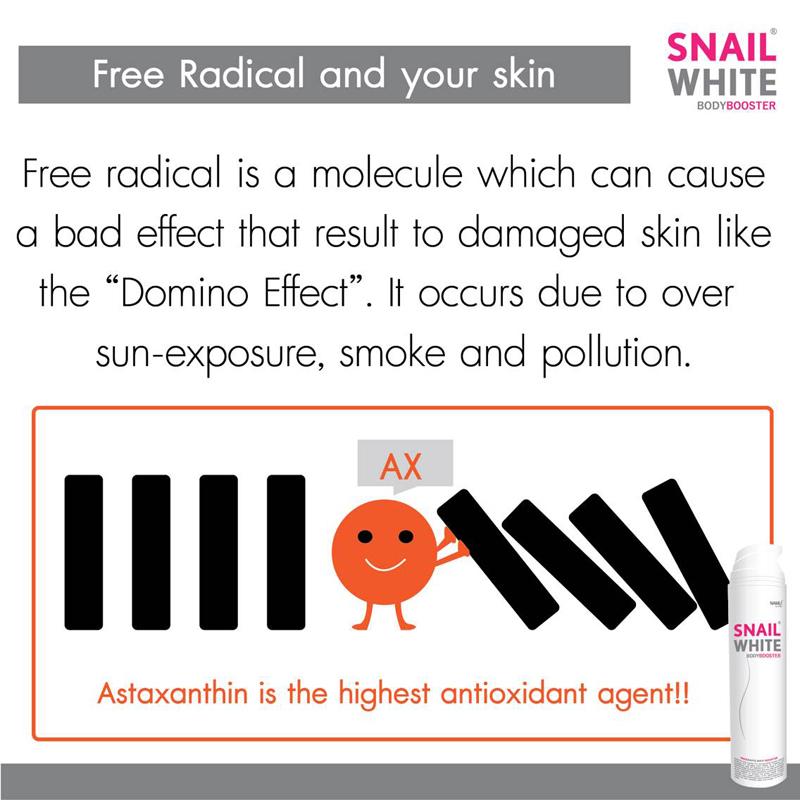 So, other than eating food with high anti-oxidants benefits, it’s also necessary to protect it externally! Do not neglect your body skin and start taking care of it at this very moment! It will thank you in time to come! FOR WHO you must be wondering? Facing similar skin issues like the above? 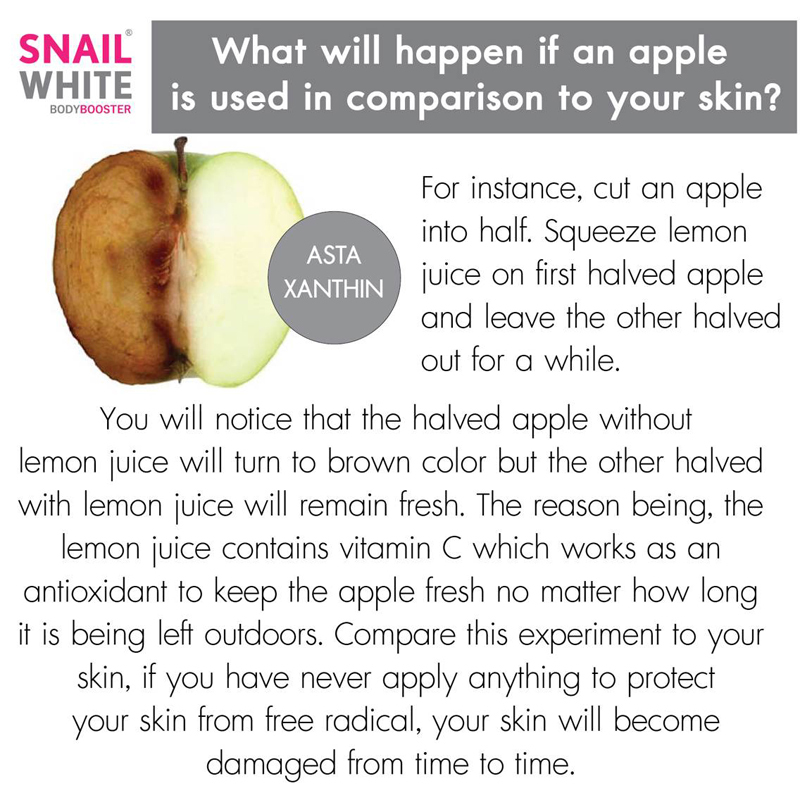 Fret not if you start taking care of your skin now! Always, always bear in mind to PAT gently for the lotion to absorb onto our skin as well as not to reduce the elasticity on our skin. 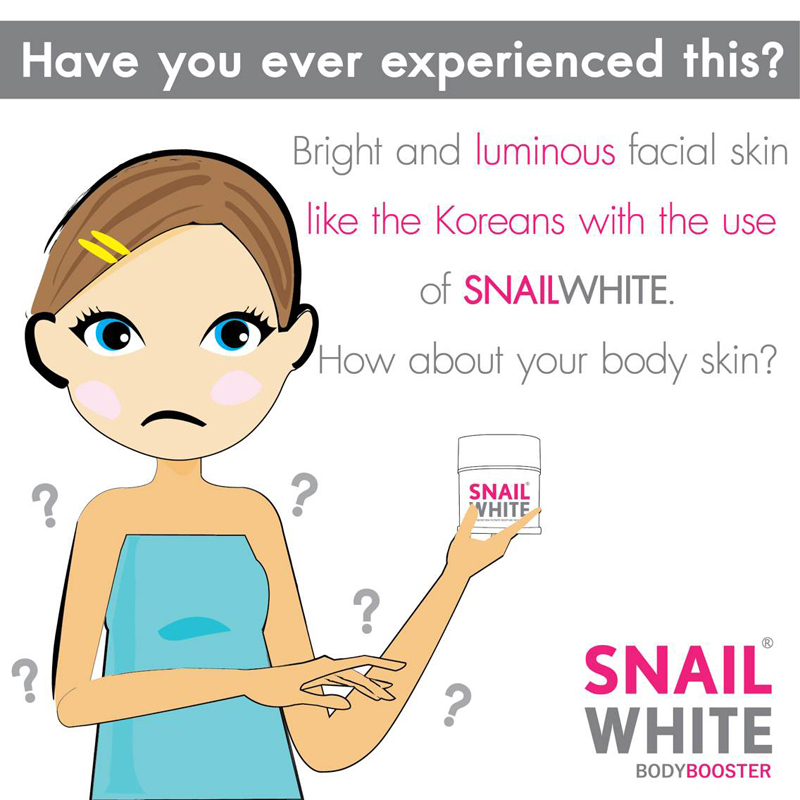 SNAILWHITE BODY BOOSTER helps to regenerate your damaged body skin against harmful UV rays, smoke and free radical so that your body skin will become healthy, bright and smooth again. 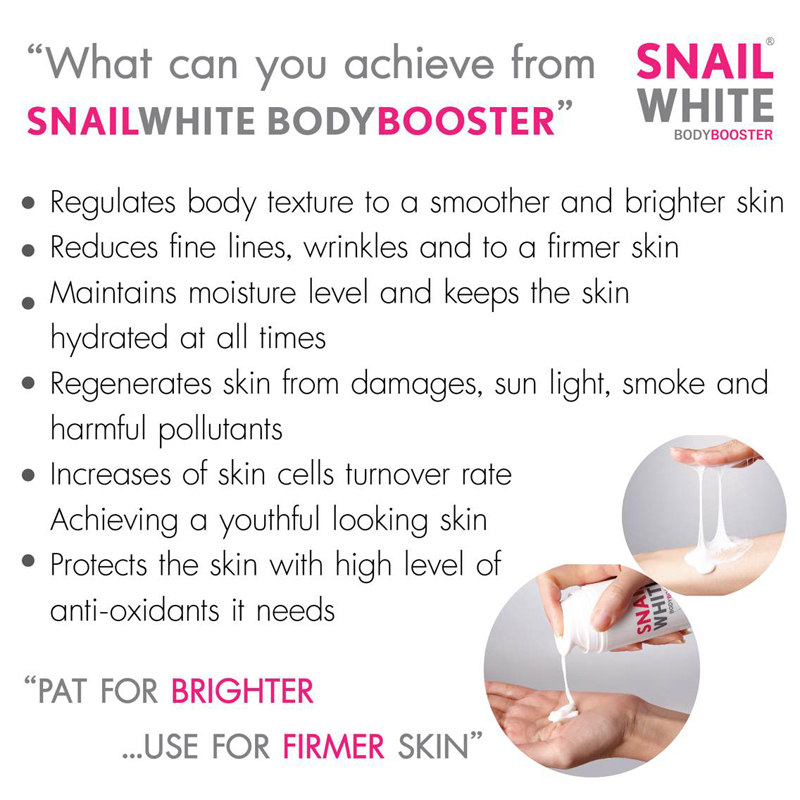 SNAILWHITE Body Booster is the ultimate combination of high quality concentrated ingredients under SNAILWHITE. 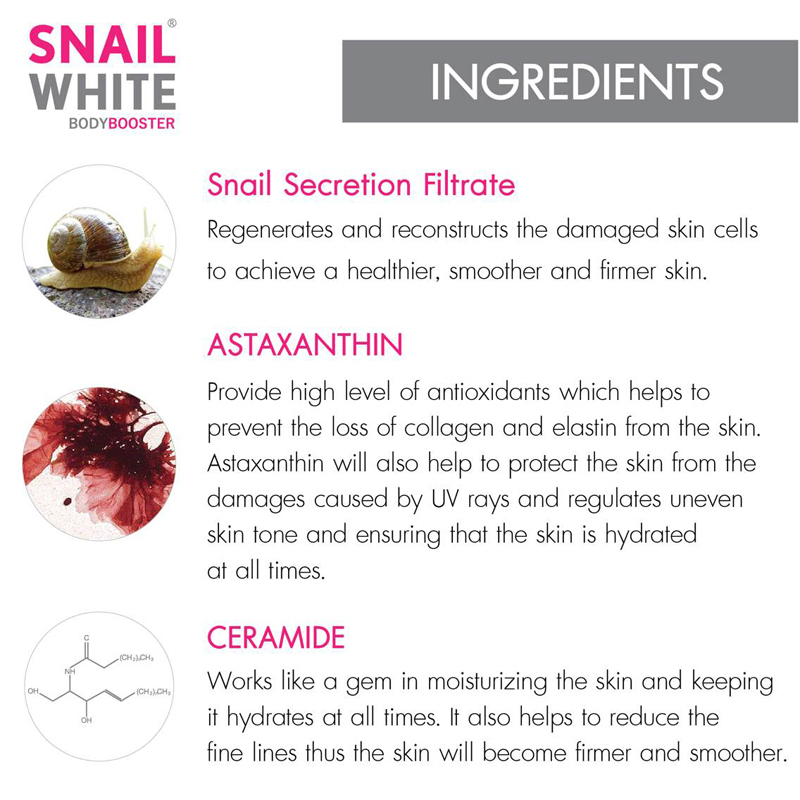 So, definitely Snail Secretion Filtrate being one of the mains! 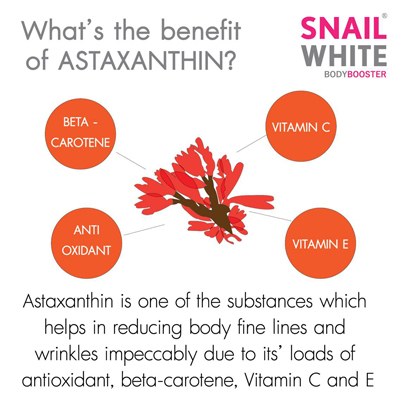 together with Ceramide and Astaxanthin. 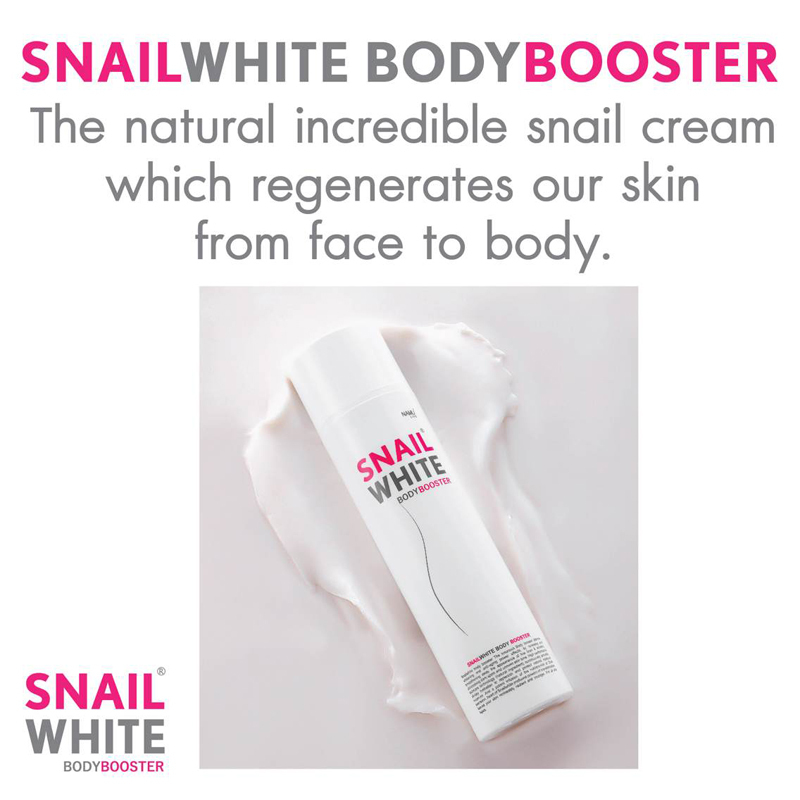 If you are already a SNAILWHITE enthusiast, you should probably realize by now that it’s products absorb easily onto skin and not leaving a greasy feeling after. Bingo! with the 3 main ingredients, this body treatment is in a creamy base yet light-weight enough to absorb easily onto skin, leaving skin silky smooth and soothing it at all times! Do you know that to combat away diseases, strengthen our body system and stay youthful as always, we have to consume high intake of food that is rich in anti-oxidants? 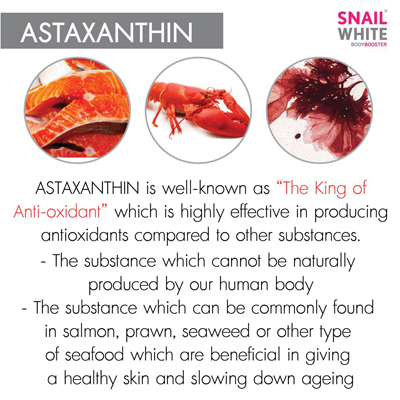 However, most anti-oxidants commonly found can’t be compared to ASTAXANTHIN which is well-known as “The King of Anti-oxidant”, highly effective in producing antioxidants compared to other substances! Not only do we have to protect our body by eating healthily, we have to pay extra care externally as well! 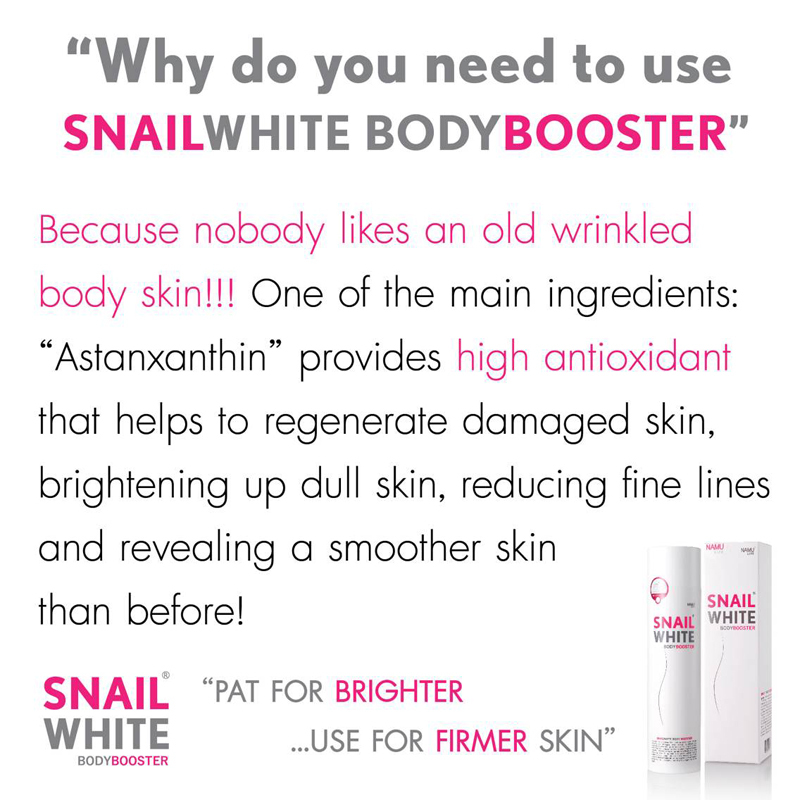 Protects your body inside out by applying SNAILWHITE Body Booster which contains ASTAXANTHIN which is beneficial in giving a healthy skin and slowing down aging too! Who doesn’t love that?